Posted on Saturday, May 8th, 2010 at 8:00 pm. Join several Asian American organizations in the SF Bay Area for the AHSC Community Mixer. Organized by viveSF for the Asian Heritage Street Celebration, they intend to bring the community together for a networking event right before the official launch party for the festival, which starts at 10 pm. Yes. That’s right. Two events back to back at the same location. One’s a mixer, the other is a party. Cool people all around. 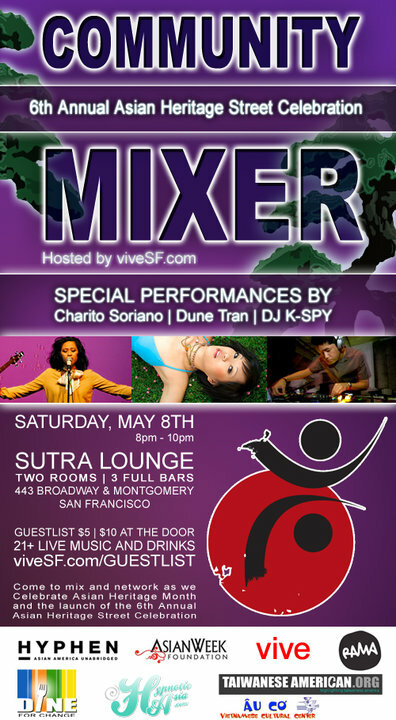 There will be two great live performances in the main room by Charito Soriano and Dune Tran. DJ K-SPY will be mixing lounge music in the second room. There will be plenty of space for you to network and mingle and learn more about how you can get involved or partner with different Asian American organizations around San Francisco.